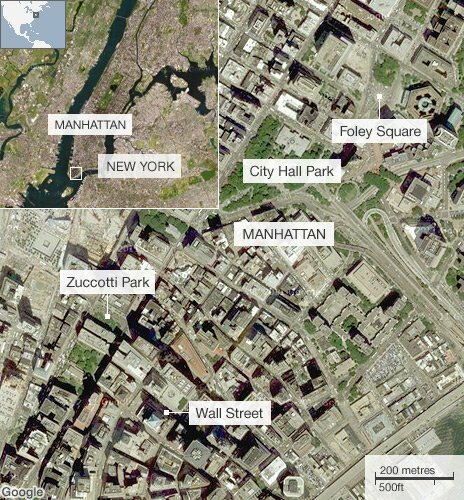 New York police have dismantled the Occupy Wall Street camp in Zuccotti Park and arrested about 200 people following a raid in the early hours. Protesters were ordered to leave at about 01:00 (06:00 GMT), before police began removing tents and property. The New York camp was set up in September to protest against economic inequality – it inspired similar demonstrations around the world. The message here is that income inequality is widening in America and that the banks received a bailout after the financial crisis which protesters feel they were responsible for causing. And that message does resonate in America, where people are still struggling with a fragile economy, but equally here in New York, there has been a division. Leaflets were handed out telling occupants to “immediately remove all private property” and warning they would be arrested if they interfered with the operation. The area around the park was sealed off and journalists were prevented from entering. Some of the activists accused police of using excessive force and pepper spray. Police spokesman Paul Browne said most people left the park when ordered, but that a small group of people had refused. The 200 or so people arrested included some who had chained themselves together. Activists released a statement saying that while they may have been physically removed, “you can’t evict an idea whose time has come”. The Occupy movement, inspired by the Arab Spring uprisings and economic protest camps in Spain, is calling for a more equal distribution of the world’s wealth and a fairer response to the global economic crisis. 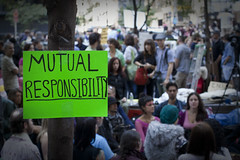 The most high profile protest has been Occupy Wall Street in New York, which began on 17 September. The protesters call themselves “the 99%” and are demanding major reforms of the global financial system by curbing the power of banks and corporations. Protests have also taken place in cities across the US, including Washington DC, Chicago, Los Angeles, San Francisco, Denver, Pittsburgh, Detroit, Houston and Boston. 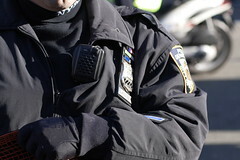 On 15 November, police moved in to clear the Occupy Wall Street protest, earlier they had cleared camps in Portland, Oregon and Oakland, California. A protest in Madrid’s Sol Square began in May and turned into a week-long sit in. Renewed protests in Europe started on 15 October with demonstrations in Rome, Berlin, Frankfurt, Leipzig, Hamburg, Dublin, Bucharest, Zurich and other cities. Demonstrations were largely peaceful, but around 70 people were injured when violence broke out in Rome. Protests at the London Stock Exchange in solidarity with Occupy Wall Street began on 15 October. After being denied access to Paternoster Square in front of the stock exchange, demonstrators organised a camp of around 150 tents outside St Paul’s Cathedral. Protesters have been told their camp can remain until the new year, after plans to legally evict them were abandoned. Demonstrations and protest camps began on 15 October in major cities, including Calgary, Halifax, Quebec, Toronto, Vancouver and Victoria. Police have cleared protesters from sites in Halifax and Ontario but campaigners at the biggest camp, in Toronto, have been allowed to remain. Protests began in Sydney and Melbourne on 15 October. Police forcibly removed around 100 demonstrators from the Melbourne camp on 21 October. Organisers in the US say most of the country’s money is held by the richest 1% of the population and that they represent the other 99%. A number of other US cities have seen protests camps spring up in the past two months, and the Occupy movement has also spread to Europe, South America and Asia.